I often hear practitioners state that they feel that the true frequency of keratoconus in the population is under-estimated by the epidemiological studies of the disease. This certainly may be true, but very likely depends on the definition of the disease used to diagnose its frequency/prevalence in the population. That said, the last decade has shown a tremendous increase in our scientific knowledge base on keratoconus, and other corneal diseases. Optometry and Vision Science (OVS) will publish a Feature issue in late 2015 or early 2016 entirely dedicated to highlighting the research advances in one of the major topics of interest today: Contact Lens Comfort. While OVS has published a number of papers on this topic over the past three years, there are many more research programs and projects that are currently addressing this issue in basic, clinical and practice research settings. Publication of this research work will advance the field in the coming years. OVS will work with an esteemed team of guest editors including: Mark Willcox, Jason Nichols, Fiona Stapleton, Eric Papas, Debra Schaumberg, Loretta Szczotka-Flynn, Pete Kollbaum, Lyndon Jones, Tim McMahon, Meng Lin, Barbara Caffery, Nancy McNamara, Maria Markoulli, and Robin Chalmers. The window for manuscript submission is: March 1, 2015 through September 1, 2015. Early submissions are encouraged; they have priority dates for E-publication (soon after the authors have corrected the first proofs). All papers accepted in the peer review process will be published in OVS in a timely fashion, but the actual selection of those for the Feature issue will be a separate decision by the Guest Editor team and the Editor-in-Chief. Anticipated publication date for the Feature Issue is no later than January 2016. All manuscripts will be peer reviewed and must be submitted online at http://ovs.edmgr.com. Submissions must be prepared according to the Instructions for Authors available at http://edmgr.ovid.com/ovs/accounts/ifauth.htm. Indicate during the submission process in the "Author's Comments" box that your paper is intended for the feature issue. Jason Jedlicka, OD, FAAO, FSLS, FCLSA is joining Contamacâ€™s professional services team. Dr. Jedlicka brings nearly 20 years of contact lens fitting and design experience. Having completed a Cornea and Contact Lens Residency in 1997, he subsequently was the Director of Contact Lens Services at the University of Minnesota for 11 years, and is currently the Chief of Contact Lens Services at the Indiana University School of Optometry. He was a founding member of the Scleral Lens Education Society and is the Immediate Past President. Jedlicka is a fellow of the Contact Lens Society of America and a diplomate in the Cornea and Contact Lens Section of the American Academy of Optometry. He has been involved with research and the design of lens materials and solutions for several companies over the last 10 years, and has served as a consultant to the contact lens industry. Contamac also announced the appointment of Vanessa Ruiz as a new Sales Executive for contact lens material customers in Central Europe and Asia. Ruiz received her Business Administration Degree at the Berufsakademie of Thueringen, Germany. She gained a strong sales background working for the grocery chain Lidl in Germany as District Manager and expanded her international interests living abroad for almost 3 years working in the clothing retail and travel industry. Researchers recently unveiled a new prototype of a telescopic contact lens which works in combination with smart glasses. The glasses allow the wearer to control the zoom feature of the contact lens with eye winks, and are designed to recognize winks and ignore blinks. The scleral contact lens is 1.55 mm thick and has a very thin reflective telescope inside. Tiny mirrors reflect the light, expanding and magnifying viewed objects so what you see is similar to what you can see through low magnification binoculars. The telescopic contact lens magnifies 2.8 times. Since the first prototype in 2013, the developers have been fine tuning the lens material so it can be worn comfortably over longer periods and making the lens more breathable. The developers are still working on improving oxygen permeability and image quality. This is still research, but developers are hopeful it will eventually become a real option for people with AMD. Here is a link to one of many recent stories on the lens/smart glasses combo: http://www.medicalnewstoday.com/articles/289504.php. Optometric professionals are encouraged to plan to attend the American Optometric Associationâ€™s (AOA) 2015 Optometryâ€™s Meeting, which will take place June 24-28 in Seattle, Washington. AOA-member ODs and their staff, who take advantage of early bird registration now through May 1, can enjoy savings of nearly 20% off on-site registration fees. Former Navy SEAL Robert J. O'Neill is the keynote speaker for the Opening General Session (sponsored by Johnson & Johnson Vision Care, Inc.), delivering his insight on leadership and decision-making. The Celebration of Optometry (sponsored by HOYA) is headlined by Sinbad, ranked by Comedy Central as one of the top-100 stand-up comedians of all time, while performance painter Brian Olsen colors the stage with his unique twist to speed painting. The all-new 'OD Talks' session, inspired by TED-style talks, outlines the profession's future on Wednesday, June 24â€”an accredited CE event. Five days of CE kicks off at 12:30 p.m. Wednesday, June 24, and continues through noon Sunday for an additional half-day of CE. Online registration is fast and simple at optometrysmeeting.org. This aphakic patient with a post PK cornea and a 15mm, +16.50 silicone hydrogel contact lens was fitted three months after the surgical procedure. 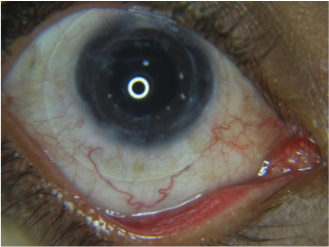 With the lens the patient restored his VA to obtain binocularity. A key issue was the alignment of the optic center of the lens with the visual axis of the eye; the centration was achived by selecting the appropriate sagittal height of the contact lens. We thank Dr. Ibanez for this image and we welcome photo submissions from our other readers! It is easy to submit a photo for consideration for publishing in Contact Lenses Today. Simply visit http://www.cltoday.com/upload/upload.aspx to upload your image. Please include an explanation of the photo and your full name, degree or title and city/state/country. One of the most overlooked components of good contact lens care has been the contact lens case.1,2 It is well-documented that microbial contamination of a contact lens case can lead to lens-related adverse events.3 A recent paper by Wu, Willcox, and Stapleton4 looked at the association between the levels of lens case contamination and lens wearersâ€™ hygiene habits. 3. Using the lens case supplied with the manufacturerâ€™s solution. Poor (or lack of) hand-washing5 has long been implicated in contact-lens related keratitis and it makes sense that it affects the case as well. It never ceases to amaze me why some patients do not wash their hands prior to handling their lenses. Also of interest is the third point: patients should use the case that was provided with their particular multi-purpose solution. It is what is most compatible with that solution, and together they comprise a care system. 3. Wiley L, Bridge DR, Wiley LA et al. Bacterial biofilm diversity in contact lens-related disease: emerging role of Achromobacter, Stentrophomonas, and Delftia. Invest Ophthalmol Vis Sci. 2012;53:3896-905. 4. Wu YT, Willcox MDP, and Stapleton F. The effect of contact lens hygiene behavior on lens case contamination. Opt Vis Sci 92(2); 2015:167-174. Most of us have an understanding of what orthokeratology is, but the data reads strongly that most of us do no ortho-K, few of us do some, and a couple do A LOT. Prior to buying my practices, I had the pleasure of working for several years in Seattle with an ortho-k guru. This doctor has created an ortho-k practice that brings patients in from all over. He does not shy away from a challenge, but proceeds cautiously in complicated situations. I recall one patient who had a -10.00 refractive error that we took on. Although the patientâ€™s refractive error wore off slightly throughout the day and she had a residual -1.00 by the end of the day, this patient was able to SEE without contact lenses and glasses. She was happy to carry glasses with her for the needed times of vision correction. Orthokeratologists are master corneal movers. They know how to mold and bend the cornea in order to create optimal refractive correction. Through the use of lenses they can correct for astigmatism, hyperopia, presbyopia, and of course myopia. If you want to start molding and moving corneas, I would encourage you to reach out to a colleague or your laboratory for help. As someone who sees a couple of ortho-K patients a week, I am proud to say that moving the cornea is rewarding for you and your patients. Publication Analysis of the Contact Lens Field: What Are the Current Topics of Interest? The purpose of this study was to determine the main current research interests of scientists working in the contact lens field. All articles published in the 2011 issues of all journals included in the Journal Citation Reports subject category Ophthalmology were inspected to expose those papers related to the contact lens field. Information regarding source journal was obtained and authorship details were recorded to determine the top most prolific authors, institutions and countries. A comprehensive list of key words was compiled to generate a two-dimensional term map in which the frequency of occurrence of a particular term is defined by label size and the distance between two terms is an indication of the relatedness of these terms, based on their co-occurrences within groups of key words. Clusters of related terms were also identified. Visual examination of all articles uncovered a total of 156 papers, published in 28 different journals. Contact Lens & Anterior Eye, Eye & Contact Lens and Optometry and Vision Science had 27 articles each. The most prolific authors and institutions revealed the predominance of countries with long research tradition in the contact lens field. Ten different word clusters or areas of interest were identified, including both traditional, yet unresolved issues (e.g., comfort or dry eye), and the latest research efforts (e.g., myopia control). The authors concluded that these findings, which revealed contact lenses to be a fertile area of research, may be of relevance to new researchers as well as to those interested in exploring the latest research trends in this scientific discipline. Cardona G, Sanz JP. Publication analysis of the contact lens field: What are the current topics of interest? J Optom. 2015 Jan-Mar;8(1):33-9. doi: 10.1016/j.optom.2014.02.003. Epub 2014 Mar 25.